When the vet told me Jack needed surgery as soon as possible, I was instantly overwhelmed and felt completely unprepared. Even though my vet was fantastic at explaining all my options, the fact he was going out of town next week combined with the genetic problems Jack had that would complicate his current situation (torn ACL) left me having to make a decision extraordinarily quick. So on Monday I booked surgery for Wednesday, hoping that within a couple of days I could inform myself of not only the surgery (and if it could be avoided) but also any holistic and alternative treatments that could be done. I have found it somewhat hard to find the information I was looking for and then when I did find it, I felt really overwhelmed and confused by it all. I’m a “simple approach” kind of girl but then when I started to see all these ideas, supplements, food diets, options I just didn’t know where to start. Luckily I received some really good advice/tips on here (thank you, so, so, much!) and found some really useful bits online. When I was first told the cost of the surgery (between $2,500 – $6,000) I was floored. That alone was a lot to take in and had me questioning if he needed it and, if he did, what type (nylon band or TPLO).After a lot of research and talking to a couple of vets,I decided to go with the nylon band surgery route with Jack instead of just chiropractic care or the new orthopedic procedure of TPLO. My reason behind this was Jack’s size – he’s 55lbs (22.4kg), his age (2) and his activity level (moderate meaning we walk about 2 hours a day and he does “zoomies” where he runs like crazy for about 20min). He’s not a working dog, he doesn’t hike often, and he doesn’t really run for long periods of time. If he was, I would have perhaps chosen the TPLO route but I didn’t like the thought of a foreign object being inserted and part of his bone being chipped away. I had this done on my hip and the after surgery pain was the most intense and the healing was never quite right. I also heard of the plates popping out – especially since it gives dogs a sense of feeling better sooner and they try to do more. I felt the nylon band was a less intrusive surgery but would give stability to his knee, important since he has hip dysplasia and is a bigger sized dog. I kept Jack on his bed for most of the day, massaged him a lot, spoke to him in happy tones, and made sure he had lots of water and ate. Although I was given Rimadyl and pain medication, I was very reluctant to use it and used it very sparingly for just one day. The reason is that I read a lot of negative information on Rimadyl and how it can also be dangerous before surgery (as it’s a blood thinner). I wanted to manage Jack’s Pain but not have him dopey. By massaging, rest and giving him Arnica, Jack was relaxed, calm but also alert – even wagging his tail in the evening. The trick was to just really watch Jack to see how he was. I kept notes on him in my notebook – like a nurse in a hospital – so I could tell when he was perking up or in pain, when I last gave him something. 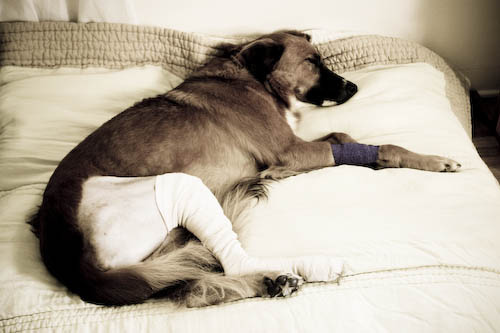 Orthopedic surgery is the most painful surgery for an animal and almost all holistic information agreed that the day of and after surgery, pain medication is necessary. When I picked him up from the Vet he had been given a shot of pain killers which made him extraordinarily groggy and sleepy. Since he had had this for two days, tonight I’ll give him one last pill and then tomorrow start him on Arnica again. I bought the Boirin Brand at Whole Foods which comes in little pellets of 6C. I give him 5 pellets in cottage cheese and this seems to work really well. Dog Feeding Info: this site gives a quick overview and lots of links to dog feeding and supplements. I have always given Jack EVO brand food because of it’s high protein count. I’m still using this but am now adding more raw foods to his diet. I went to Whole Foods and got liver, turkey legs, sardines, eggs, cottage cheese and yogurt to make up his breakfast and dinner. Your local butcher will likely give you the liver, heart and bones for free. I spoke with my butcher at Whole Foods and he tells me what day they’re getting a beef shipment in so I can call that day and ask them to set these aside for me. Like I said, I haven’t perfected this and am still learning so I’ll post more on the recipes once I get a routine down. The cottage cheese is great for giving him pills, however. Just pop them in and the dog won’t know! I have been spending a lot of time on this site to learn and also am now using the Complete Holistic Dog book as well. Supplements: I’m a huge believer in supplements but not in overdoing it. Omega oils are so important for joints/arthritis that getting this was my first priority as well as probiotics to counter all the antibiotics he’ll be on. I ordered Wholistic Canine Complete Joint Mobility from The Holistic Pet because it uses human-grade ingredients instead of synthetic and because it covers so many basis in one easy step. In addition, I chose 3V Caps Skin Formula for Med/Large Breeds (60 caps) which my vet suggested as it’s a good source of Omega-3 Fatty acids. Before surgery, I was giving him two different supplements: Pet Naturals Soft Chews Hip & Joint and Daily Best. Both are packed with lots of vitamins and are sugar free (great if you have a hyper dog) and I’ll resume giving these to Jack in about two months. Right now and for the next two months, he needs a high medicinal dosage of vitamins which is why I’m using the above. But Pet Naturals is a good compliment to your healthy pet if you don’t want to do the big vitamin route. BEDDING: Knowing that Jack would have surgery, I wanted to make his recovery as easy as possible. The priority was to find a good bed that would provide support, be organic, and have a washable cover. Until now, he’d been lying on a blanket but I didn’t want him having to bend far down or resting himself on the floor. The bed I chose was by Jax and Bones. Not only is their cover washable, but you can by the cover separately which is great if in the future you change decor and want to change the bedding. I chose a medium size square bed for Jack and let him sleep on it a few days before the surgery to get used to it. But really, he loved it the minute he laid on it. It’s so fluffy, so supportive and just all around comfortable that Jack was happy to lay there which was good since laying is what he has to do for the next two weeks! This bed is not cheap but I felt it was important to get one that really provided support and comfort. If he laid wrong on his knee, if he was cramped, if he plopped down and hit floor where cushioning had shifted, that would have prolonged healing or made things worse. I thought the benefits of this bed were worth the cost. Like I said, Jack slept happily on a blanket before and had it not been for the surgery, I wouldn’t have gone to this expense. But this was all part of the holistic healing experience. Petsafe Bottoms Up harness helps support Jack’s backside whilst walking. I put it on before surgery to practice and get him used to it. It’s a little tricky for me to use because I’m small (5″3) and he’s tall but it does provide relief to him for walking. Ruff Wear Grip Trex Boots: Jack’s whole leg is bandaged up to keep his stiches clean and prevent infection. It has to stay on for the next two weeks so keeping it clean is essential. Although Jack won’t be doing any walking and I’m using the harness, he does put his foot down a little and will be doing so more as he heals. I put one boot on his bandaged leg to keep the foot/bandage clean when he walks on the walkway outside (which is often wet from garden watering) and grass. A lot of people say they use them on dogs who have had surgery after to help them with support so I’ll have to see how it works out with all four! The Gulpy is something that has proven really useful. I use this all the time on walks & car travel but it’s come in especially handy for recovery. I can just flip it open and give him water lying down without him having to get up to get to a bowl. No Bite Collar: Those Elizabethan collars that are used to prevent pets from licking their wounds are awkward and uncomfortable. The No Bite collar is an easier, less intrusive way to keep pets from licking. Jack is really good about it but people recommend it for when you’re away, at night, and once the bandage comes off. Solvit UltraLite Bi-fold Pet Ramp: I haven’t tried this yet but I’m thinking about it. I don’t own a car, I have to rent to get him to and from places, so I’m not sure if it’s worth it for me but maybe since lifting him is hard. Complete Holistic Dog Book: Home Health Care for Our Canine Companions was highly recommended to me and, having just received it today, I can see why. It provides so much information in a very easy to read and understand way. If you have a dog, you must have this book because it covers everything from nutrition to massage to surgery. A lot of things I’ve read in books seem overly complicated or don’t deliver it all. I’ve got Dr. Pitcarin’s book but I found it failed me in Jack situations. The Holistic Dog book is much, much better. Canine Vitamin Adviser: Gives you an idea of vitamins but I’d use this as a really loose guideline. It’s best to talk with a vet or holistic practitioner. Recovery from TPLO surgery information here, here and here. While Jack was in surgery, I used that time to get everything together. I also used it to really clean house which meant scrubbing all my hardwood floors (using organic cleaner), washing all his bedding (I actually had to take his blanket to an organic cleaner for quick, overnight cleaning), making the entire flat calm and clutter free so he wouldn’t have trouble getting around and he’d have a safe, clean, quiet area to sleep (which is right behind my work desk and right beside my bed). I also took the time to get all the food ready, get the gear he needed and research about what to do with it all. This also helped me from spending the day worrying about his surgery! This route is expensive but the way I look at it is that I’m giving him the best chance at a hopefully easier, quicker recover and that I’m building him up to hopefully prevent it from happening again or arthritis settling in too soon. It’s about balancing options with finances and making the best choices I can for both of us. The best advice I’ve gotten from almost everyone is to just follow Jack’s lead. He’ll know when he can stand, when he’s hurting, when he’s feeling better so just to pay attention to that. In the meantime, I’m keeping him rested, calm, and taken care of whilst still looking for ways to help him heal (including looking into chiropractic care and hydrotherapy). So any additional tips or advice still appreciated! Keeping a log of everything from potty breaks, to feedings, to breathing patterns to medicine has proven crucial. I highly recommend doing. After 3 days I stopped giving him the pain meds and started to give him 30C of Arnica. He’s done so well on that that yesterday I gave him only one dose at night. If he’s restless, fussy or breathing heavy it’s a sign he’s in pain – this usually comes on now if he’s sleeping on the surgery side. Carrying him up and down the stairs has been the hardest. Having the back harness is also crucial and helps whilst walking him and helping him with the bathroom. He hasn’t wanted to eat any of his regular kibble food which I found is a really common thing after surgery. Luckily I’ve been doing the raw food – liver, canned salmon or sardines, eggs along with kibble. I put the Arnica in some cottage cheese, which he loves and gives him some nutrition as well. He’s been drinking/eating fine but I’ve cut back on the amount of food but not too dramatically. He’s skinny and I fear him losing more weight. He’s been a lot more alert over the past 3 days and last night he waved his tail high and proud outside! The hardwood floors have been really hard for him, though. When I pick up the leash he gets so excited, he slips. So trying to keep him calm is a challenge. He gets lots of rest. I, however, have been a complete mess. The first 4 days were the hardest since he was up a lot and uncomfortable which means I was. The lifting is hard and really actually scary. Seeing him in discomfort and feeling helpless was the worst and not something I was prepared for. Knowing he has to be restricted for 3 more weeks is really overwhelming for me – we’re both going a bit stir crazy being at home. This is definitley one of the harder things I’ve gone through and definitley for Jack. What a relief to hear Jack is doing well. Between his character and yours there was never a doubt in my mind. Keep up the good care and thank you so much for all the information you were so kind to take the time to share. Perhaps you could make it an automatic link so we can all refer back to it instantly. Perhaps it could be combined with watching / updates of Jack getting / all better! Oh I’m so glad the surgery went well. And thank you for all the links and info, I will be looking into a lot of it for my pup as well. I want to balance her diet out, she has been quite a picky little madam but I really want her to eat healthily. And this Wholistic Canine sounds great, I will have to have a rummage and see if some of this stuff is available in Europe too. I forgot to tell you in my comment (which was too long as it was 🙂 to be careful with the liver and hearts. I dont think it should be a problem with Jack (given that he is 2 years old and still a pup really) but when we gave Astor hearts and liver, he did love it but he got diarrhea. I asked the vet afterwards why did that happen she told me it was probably because he was older and his stomach was sensitive from the antibiotics. And I got your thank you note, really it was not necessary, it was nothing. I’m a practical sort and I have been there I know how overwhelming it can be… just sharing the information can be helpful and can help ease the stress of it all. Just love the photograph of Jack. I was pleased to hear the surgery went well, I know it can be a nerve racking time. It is often difficult to decide what to do for the best, particularly as you seem to have the habit that I to suffer from….too much research giving yourself too may options. Eventually you just have to make the decisions with heart, head and instinct, which it sounds as if you are doing very well. I believe that the love and care you give to dogs is rewarded with an unconditional love that is priceless. Wishing Jack a speedy recovery. He’s a lucky dog to have such a good mama. Hope he recovers quickly. I wish you and Jack D the best! I highly recommend a raw meat diet. I use Sojourner Farms (sojos.com) European Style dog food mix (grains & healthy stuff), mix it with raw meat & veggies and my dogs love it! Our 8 year old chihuahua has been on this diet since she was a pup & she still has the energy of a puppy. it’s great to hear Jack is doing well. i have to say i love that picture of him. his smile makes me smile. Glad to hear Jack is doing well. Sounds like you are providing everything Jack needs for a good recovery. I know how stressful this can be, in my situation I was dealing with a 30kg elderly dog. My Barkis needed help up and down the stairs and we had to contend with ice and snow. I was only alone during the day though, my guy was there the rest of the time. I wonder if you could hire someone from a dog walking/pet sitter service to help you get him up and down the stairs. My little Robin says woof to Jack. Sending healing vibes to Jack and thoughts of comfort to you both. Here is an easy way to do the raw foods, if you choose the preference line, you can add your own meat. Thanks everyone for all the comments and emails – so much appreciated by Mr. Darcy and myself. It made a harder experience a little easier. Lots of wonderful advice! Thank you so much for putting together all of this information. We’re so nervous for our Murray to go through surgery (his kneecap is dislocated), but this is all really helpful.